Depicts the destruction of innocence resulting from the utter mindlessness and inhumanity of war. 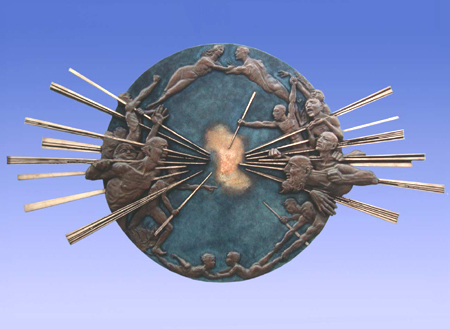 Spears penetrate the circle of global unity, thrusting inward toward the center while its fringes are ripped apart. This inward thrust of aggression creates a critical mass at the center, igniting an outward explosion. Spears penetrate a circle of global unity, thrusting inward toward the center while the fringes are ripped apart, destroying innocents. The inward thrust of aggression ignites a critical mass at the center, causing an outward explosion.